If there is such a thing as a superstar in the Americana genre then Gillian Welch is one. Her debut album, Revival, came out in the height of Nashville stylized indulgence – hitherto known as the Garth years – and reached so far back in style and subject matter that it couldn’t be called old school, it predated the school itself. This New York City born and Berklee College of Music educated woman became a gabardine-clad personification mountain holler laments and sepia drenched Dust Bowl yarns. Like Duluth, Minnesota’s Bob Zimmerman she embodied the ancestral ghosts of mythology and willed herself into a contemporary symbol of a bygone era by exhibiting a respect for the cultural legacy and ingenuity to work within the confines to create music that sounds not only timeless but new. To further distinguish herself , at the time of her debut many of Welch’s contemporaries were approaching their work from a folky, more Lilith-like, direction. Welch was rougher, darker, and delivered her talws with grit. Like Loretta Lynn and Wanda Jackson, she appeared to be a woman that could drink you under the table and hold herself in a fight. After an 8-year stretch, where Welch battled writer’s block and provided a supporting role for performing partner David Rawlings solo undertaking, By plan or happenstance The Harrow & the Harvest has been released to coincide with the tenth anniversary of the Coen Brothers O Brother, Where Art Thou?, a move that in many ways reflects to neo-rustic forms crafted by Welch. The movie’s multi-platinum soundtrack was a watershed moment for the Americana music genre and featured Welch performing alongside better-known contemporaries Alison Krauss and Emmylou Harris. Welch also has a cameo in the film requesting a copy of the best-selling single from the movies fictitious group Soggy Bottom Boys. 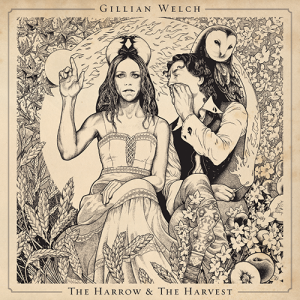 On The Harrow & the Harvest Welch heeds timeless advice and doesn’t try and fix what’s not broken by offering up 10 songs of want and worry in many varieties. Scarlet Town opens with the protagonist visiting a town calamity and deception that would make Dr. Ralph Stanley bow his head in woe. The darkness of the songs subject is countered dazzlingly by David Rawlings deft guitar picking. The Way It Will Be is a smooth-folk Crosby, Stills and Nash-like that takes the associated SoCal groove to darker regions and The Way It Goes is a jaunty ode to weary fatalism that comes from a worn soul.